For the preacher and farmer from Virginia, see Levi Miller (Virginia). Levi Zane Miller (born 30 September 2002) is an Australian actor and model. He is known for playing Peter Pan in Pan (2015), Luke in Better Watch Out (2016), and Calvin in A Wrinkle in Time (2018). Miller was born in Queensland, Australia. At the age of 5 or 6 he entered and won a drama competition with a Peter Pan monologue. He appeared in several Australian television commercials. Miller appeared in the film A Heartbeat Away (2012) and in short films such as Akiva (2010) and Great Adventures (2012). He was selected by the film's director Joe Wright for the role of Peter Pan in Pan. He appeared in Red Dog: True Blue where he played Mick. In 2015, he was named ambassador for Polo, the Ralph Lauren kids' fall campaign. In 2016, Miller starred as Luke in the psychological horror Christmas-themed film Better Watch Out where the young Australian actor's performance was highly regarded by film critics. He played Charlie Bucktin in the film adaptation of Australian novel Jasper Jones. He played Calvin O'Keefe in the American fantasy adventure A Wrinkle in Time (2018). 2011 Terra Nova General Philbrick (Child) "Vs."
2015 Supergirl Carter Grant Season 1 Episode 5: "How Does She Do It?" ^ Truitt, Brian (7 October 2015). "Levi Miller takes flight as next Peter Pan". USA Today. Retrieved 10 February 2018. ^ "Levi Miller on Instagram". Instagram. 30 September 2017. Retrieved 10 February 2018. ^ "Boy Wonder Meet Levi Miller". Standard UK. 27 August 2015. Retrieved 10 February 2018. ^ Rookwood, Dan (27 August 2015). "Boy Wonder: meet Levi Miller, the 12-year-old Pan star who's friends with Cara Delevingne and models for Ralph Lauren". Evening Standard. Retrieved 24 September 2017. ^ Justin Kroll (18 March 2014). 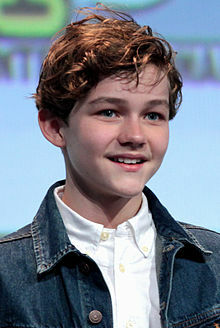 "Levi Miller Tapped to Play Peter Pan in Warner Bros.’ ‘Pan’ (EXCLUSIVE)" Variety. ^ Brayson, Johnny (11 March 2018). "Levi Miller Has An Impressive Résumé". BUSTLE. Retrieved 25 March 2018. ^ Ahmed, Musanna (5 January 2018). "Better Watch Out: Jingle Hell". Film Inquiry. Retrieved 25 March 2018. ^ "Rotten Tomatoes Critics Consensus". Rotten Tomatoes. Retrieved 25 March 2018. ^ "Wrinkle in Time Cast Announced as Filming Begins". ComingSoon.net. 1 November 2016. Retrieved 2 November 2016. Wikimedia Commons has media related to Levi Miller. This page was last edited on 1 March 2019, at 07:45 (UTC).